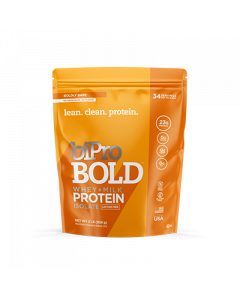 BiPro BOLD™ is a cold-filtered 100% protein isolate designed to increase daily intake of natural, healthy protein without sacrificing taste or product purity. 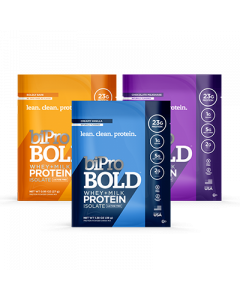 Lean and clean with 23 grams of protein per serving, BiPro BOLD is easily digested and naturally creates satiety, which means, you feel fuller, longer. We know you're busy making big life moves and need something that is as good at multi-tasking as you are, so we stepped up our formula to include prebiotic fiber to promote a healthy gut and non GMO coconut oil powder for a healthy dose of MCTs. 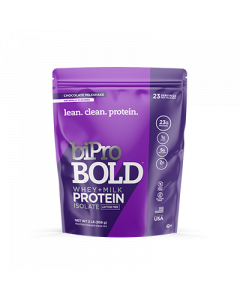 You will never find gluten, lactose, hormones, added sugars, fillers or bulking agents in BiPro BOLD. Our ‘anytime’ formula can be an effective part of daily nutrition; morning, noon or night! 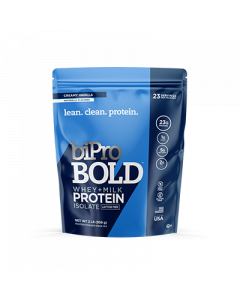 BiPro BOLD is available in Boldly Bare, Creamy Vanilla, and Chocolate Milkshake.